As the High Heel Gourmet appears to know her stuff, I decided to go by her rules. I managed to find the authentic ingredients as specified and prepared my first Thai green curry with it, and absolutely loved it! Also my friends loved it, who have been to Thailand and who eat at Thai restaurants all the time. The curry had great depth of flavor and tasted very fresh. 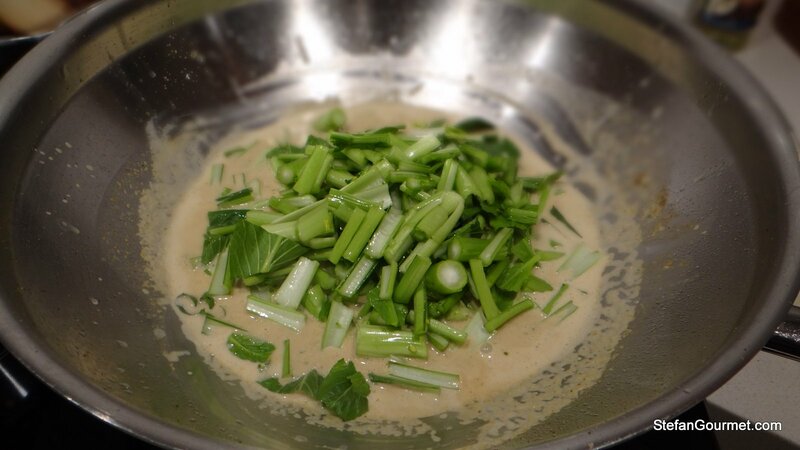 This was of course due to making fresh green curry paste from scratch. 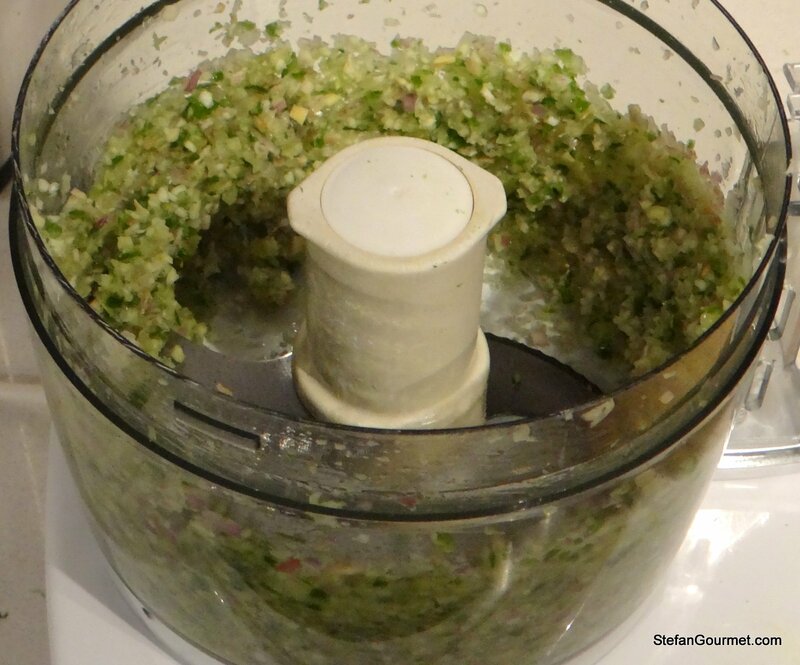 That is not a lot of work if you own a blender, the work is in finding the ingredients. It was hot but not extremely hot, and you can of course control the heat by using less or more chili peppers. My first green curry was prepared with jumbo shrimp and choi sum (which I picked up instead of bok choi to try it) and I liked it a lot. I’m not going to repeat all of High Heel’s Gourmet green curry wisdom here, you’ll just have to go to her blog to find out. Or follow the recipe below of course. 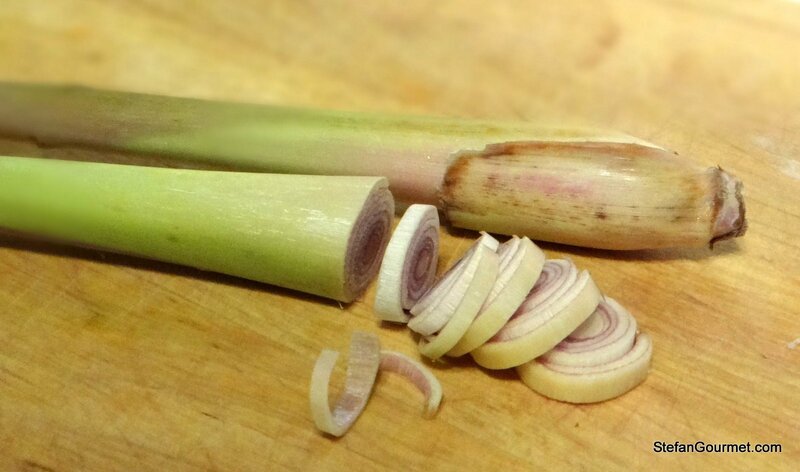 Of the lemongrass you should only use the part with purple rings. 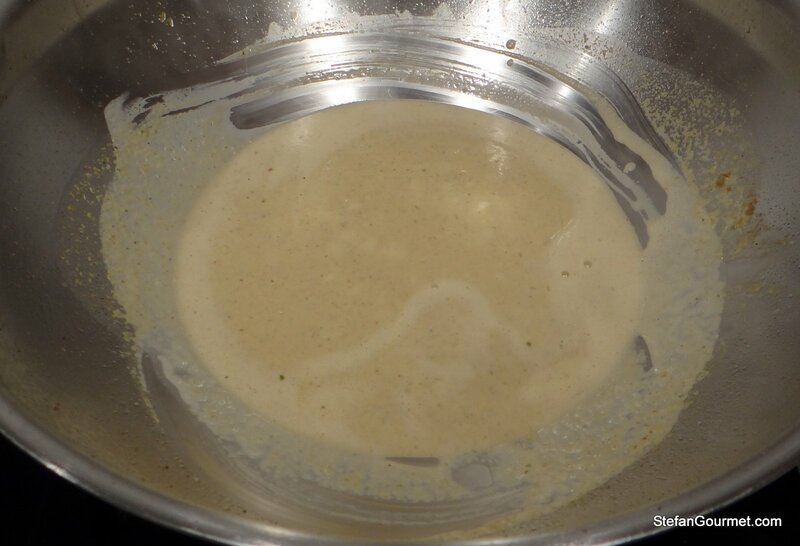 …and roast it in the oven together with the coriander seeds, and cumin seeds for 10 minutes at 180ºC/350ºF. Meanwhile, prepare the other ingredients. I only removed the stems from the chili peppers. 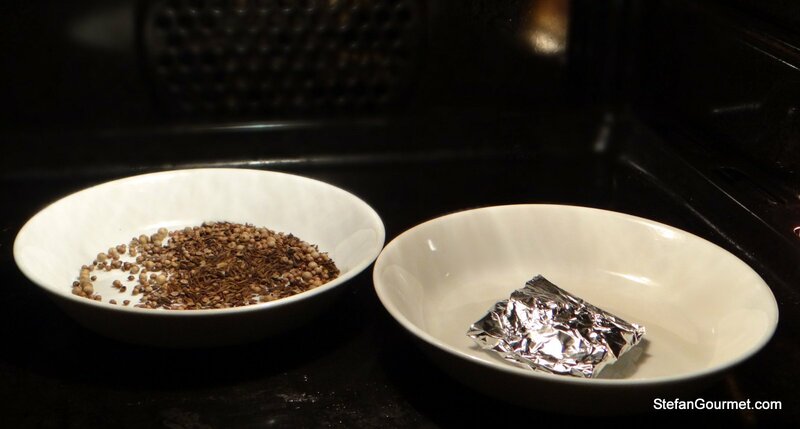 I ground the cumin seeds and coriander seeds in my spice grinder after roasting them, together with the white pepper corns. 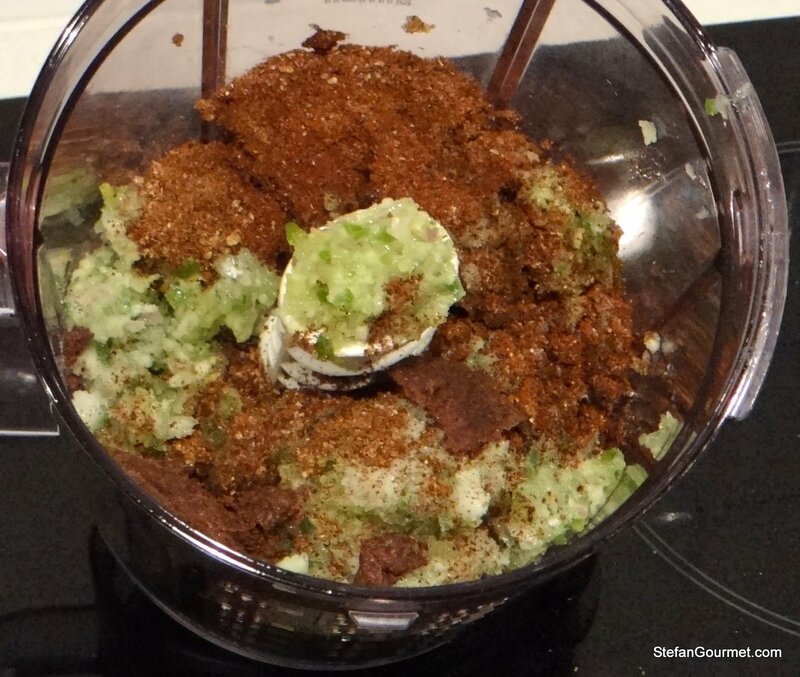 I transferred this to the blender and added the ground spices and shrimp paste. I processed this until it was quite smooth. You could add some coconut oil if needed to get things going. 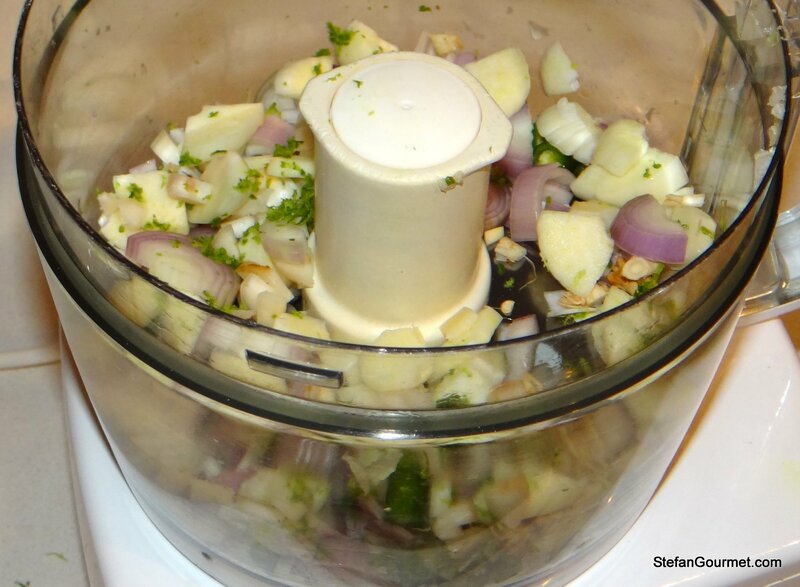 This will probably yield more green curry paste than you will need. The remainder can be frozen. I separated the leaves from the stems and chopped both. 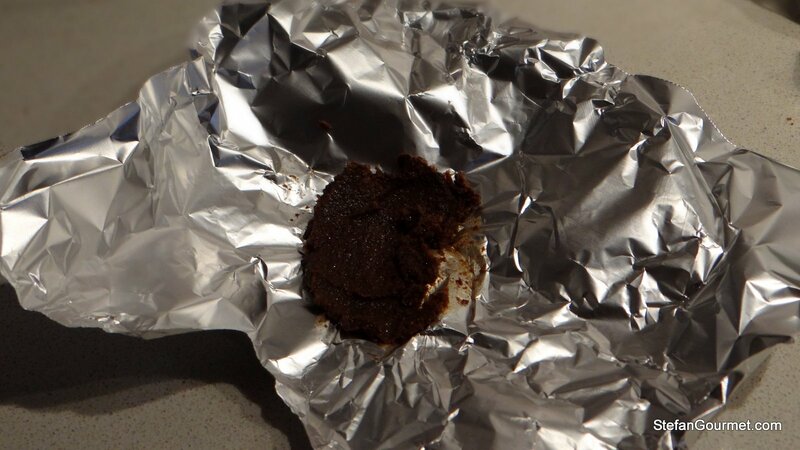 I cooked the curry paste in the coconut oil over high heat. I added the coconut milk. I added the stems, as they need to cook the longest. I cooked this for a few minutes over medium heat. …and cooked them for a few minutes over medium heat as well. I lowered the heat and added the shrimp. 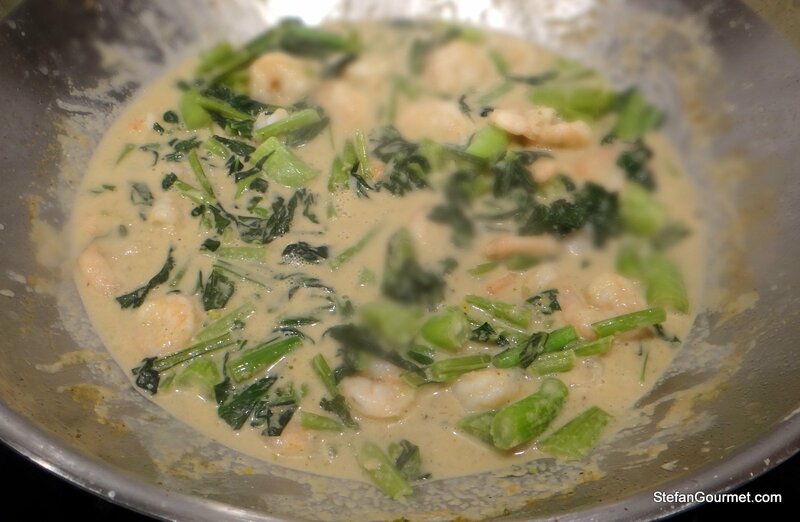 I turned off the heat and stirred in the shrimp and let them be cooked by the residual heat. 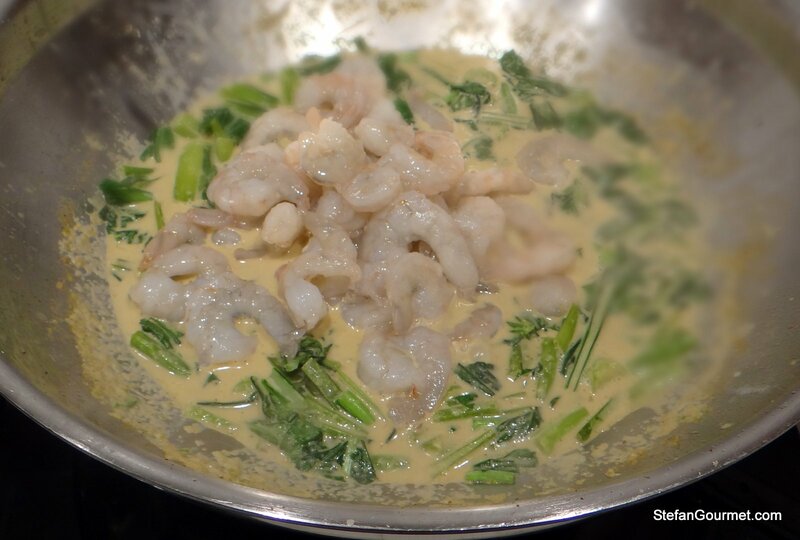 Shrimp should be cooked at a low temperature to cook them through without making them dry. I seasoned the curry with fish sauce, salt, and palm sugar to taste. I served the curry with jasmin rice and garnished with Thai basil. 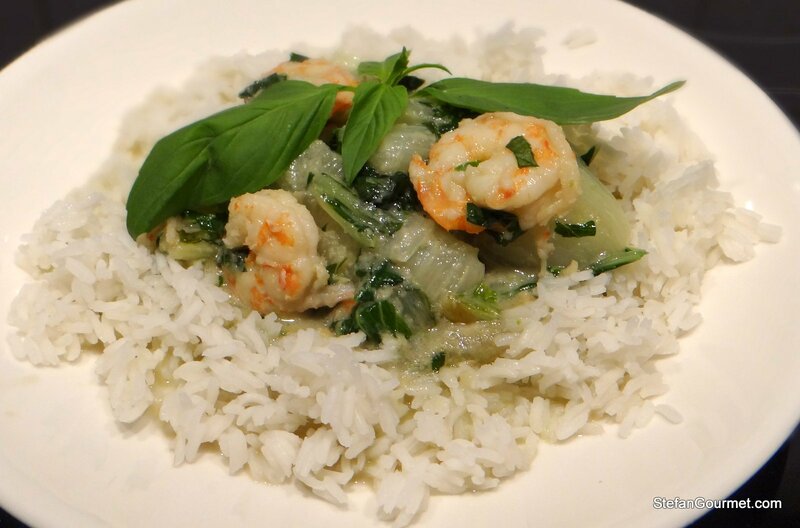 A green Thai curry with seafood is great with a sauvignon blanc from New Zealand or a grüner veltliner or another crispy white with a “green” flavor. This Thai dish looks incredible. You’re very brave to try it out. I can’t get all of the ingredients, especially the fresh ones, so I’ve never bothered. But I think the only way to have a truly traditional dish is to go to Thailand, or to Italy. It’s just something in water, don’t you think? Like baguettes don’t taste the same outside of France. That’s also why I don’t make a lot of authentic Mexican food – I can’t get all of the different chile peppers, so the resulting dish might be wonderful, but I don’t really know what ti’s supposed to taste like. That’s why I continue to make Thai-inspired and Mexican-inspired dishes, using the ingredients I can get, but knowing, unfortunately, that I’ll never know the real thing until I travel to that country. And, that’s why I travel! There is also a psychological effect of being on vacation. Different surroundings make the food (or wine) taste different. I think this green curry is some of those cases where trying to make it as authentic as possible also makes it more delicious. The flavor of this was unbelievable. I wish I could taste it! Thanks for sharing! 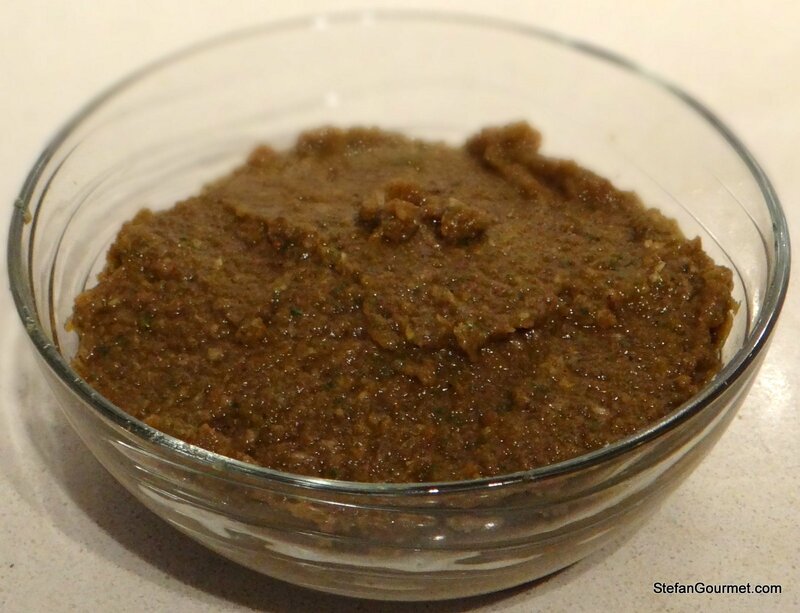 Have you ever used dried chilies to make curry paste? Is there a difference in flavor? 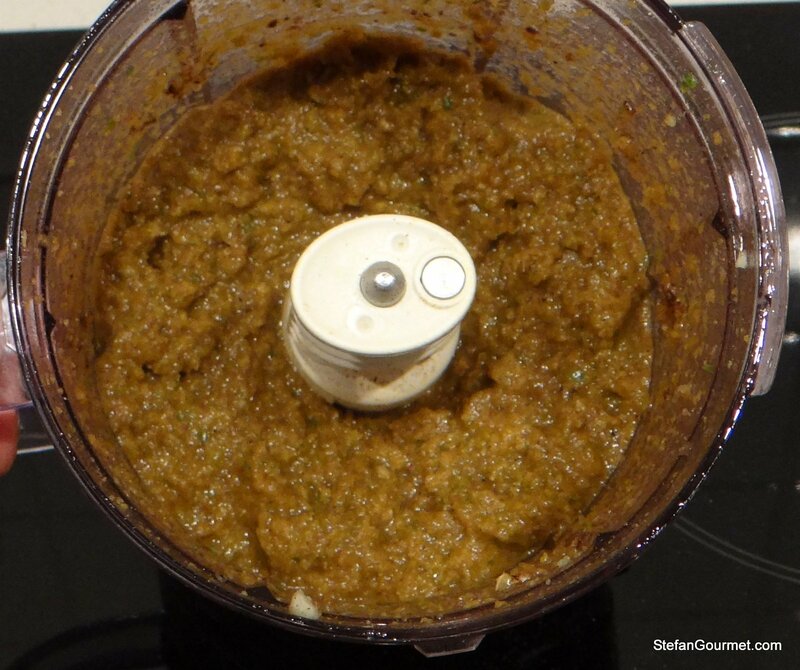 This was my first curry paste, so no I haven’t used dried chilies yet. I’m pretty sure fresh chilies will provide a fresher flavor, which for this green curry is best. That’s definitely fresh! I’ve learned to eat fish with the head still on (not that I ate the head…) when I was very little. The heads don’t bother me but they sure bothered my sons. It does seem that Americans don’t want to be reminded what they’re eating used to be alive – and possibly, very recently ! But Stefan, I’m not talking about that “experiential” eating experience, being on vacation and enjoying food. I’m talking about actually being in Italy or France and tasting the food as it’s grown, with the freshest local ingredients. Where the basil is grown, for example, which I’ve experienced in Liguria. And like I mentioned – really good French bread, that, as far as I know, can’t be duplicated anywhere. 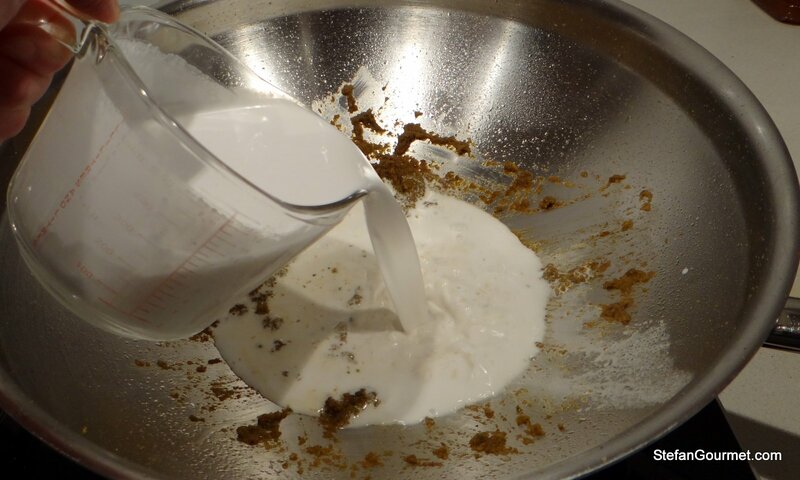 The water is different, the butter is different, and the flour is different. The weather and the growing season are both unique. But I love that you were able to get these Thai ingredients, and it is a passionate thing to create such a foreign meal. Like I said, I wish I could taste it! – In the same line of your opening comment, once on TV, Martha Stewart said, ‘if you change any of the major ingredients or methods on her recipes, don’t call them Martha Stewart recipes. Where you stand out and present with your blog is the authority in preparing food as it should be respected and highlighted. 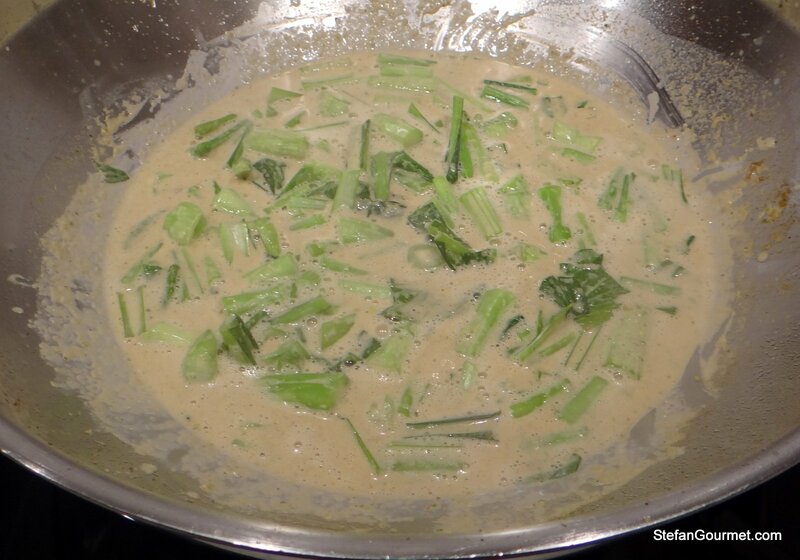 – Green curry is my (along with billions I’m sure) favorite Thai food. I had it a few times in Thailand and not all of them were good. 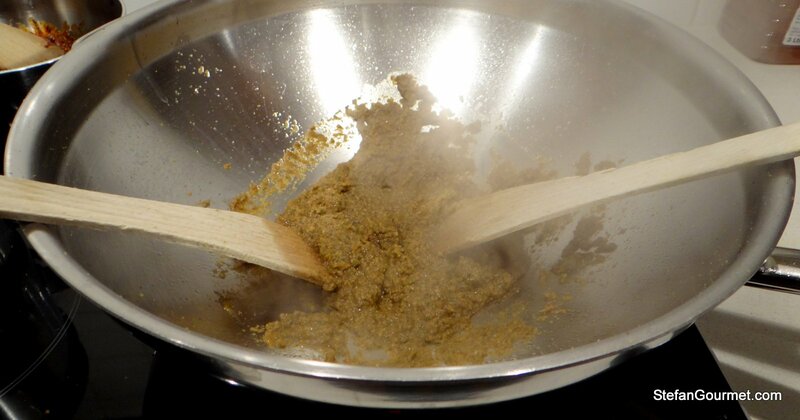 😉 Speaking for myself, I am used to cooking with ingredients I am familiar with. If a foodie, I have to get out of my comfort zone, explore the unfamiliar/authentic ingredients and cook dishes that I appreciate. Thank you for the tutorial, it gives encouragement to the novice of the cuisine. 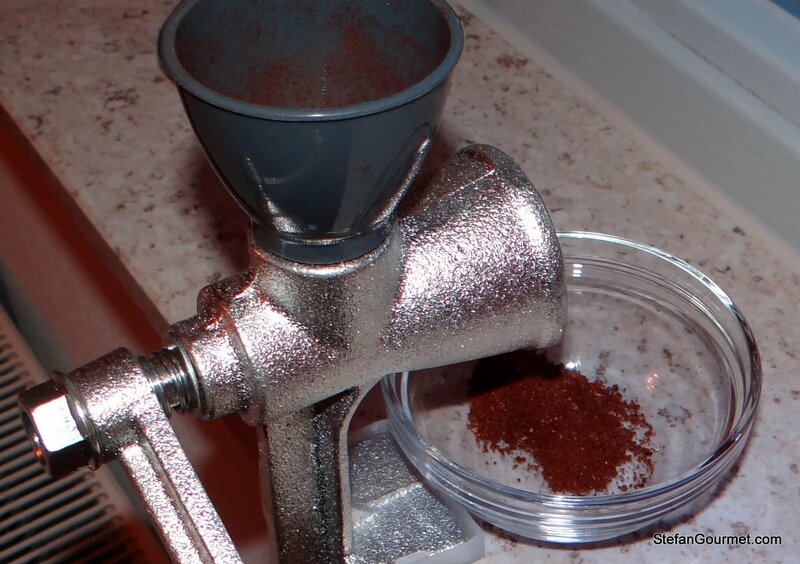 To answer to the Q about dried chili. 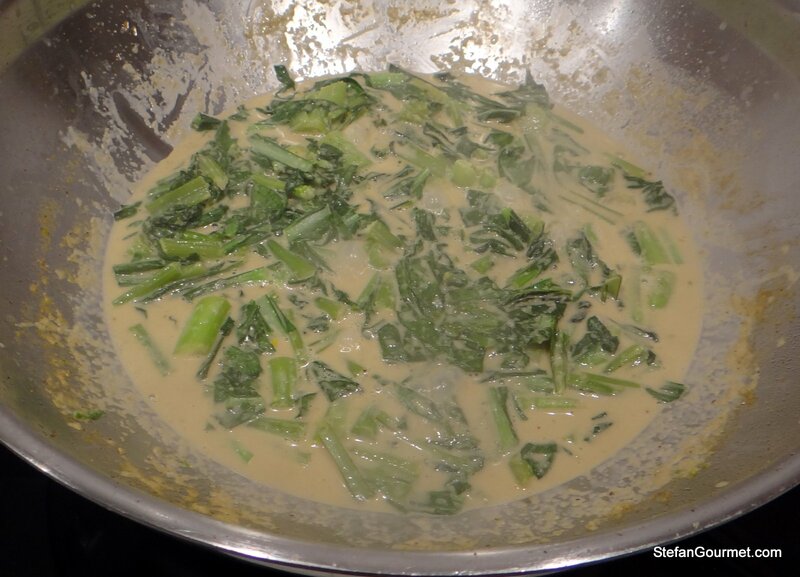 Yes, we do use them a lot in Thai curry but the color will not be green and the flavors are quite different. David Thompson’s Thai cookbook is probably one acceptable Thai cookbook that was written by a foreigner (and might be the only one). He probably understood Thai cooking principal quite well. He had a partner who was Thai and had a very good Thai cooking teacher. I would say if you can put yourself through the whole book, you would come out knowing a lot of basic. The obstacle is that it’s more like a text book, not a pleasure reading book. Great job! Maranti tweaked my Pad Thai recipe taking it from good to outstanding, so I’m sure your green curry was wonderful. Re the comment about David Thompson. He’s an Aussie who worked for many years in the Thai royal kitchens and is now considered a world authority on Thai cuisine. He operates Thai restaurants in Sydney, London (1st Thai ever to receive a Michelin Star) and Bangkok. He’s considered a world authority. I recommend his tome Thai Food! Thank you! Feel like putting that in capital letters, but methinks I’would get an ‘E’ for non-elegance! Wonderful recipe and I have or can get all the ingredients. Secondly guess who has managed to sign up for the above blog already: shall try ~ looks interesting! 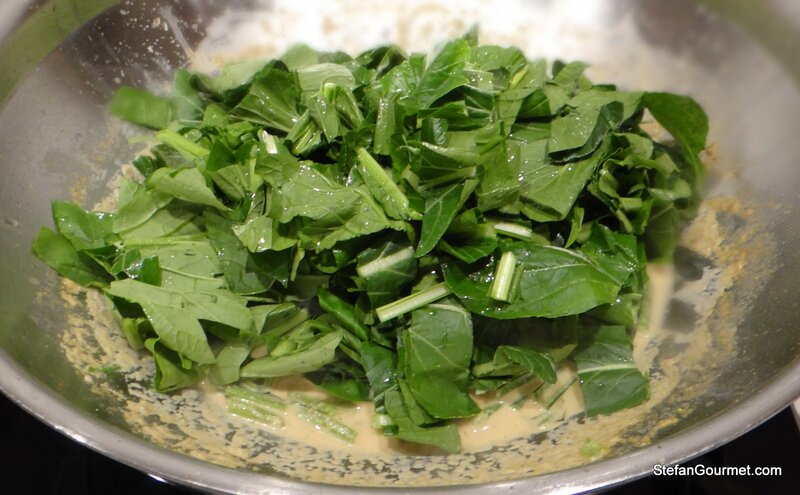 Thirdly, am not laughing at you, but have my own BP up, as have had a two-day ‘to-and-fro’ about the same: ‘If you call something classic by a name, make the classic recipe!’ with someone in the US who, of course, knew way better . . .well, am proud to be that kind of purist!!! Thanks for sharing such a spicy dish. I never had tried it at home. But i want to try it. Can i use some pieces of chicken in it? It took me three attempts to get this recipe just right, but I finally did it. I love the spicy flavor and I also like the texture of Jasmin rice (I had never used this before). Also, thanks for the detailed instructions and photos, they are very, very helpful.